Minister David Cameron after deadlock. Irish bonds were issued in the United States by Éire's president in 1919-1920. Given British Prime Minister David Cameron's hard line on the level of continued aid to Northern Ireland, this idea was recently resurrected. Cameron is seeking to pressure the Northern Irish Government to make cuts in welfare programs. 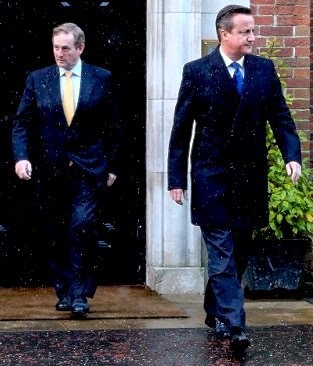 Taoiseach Enda Kenny and Cameron met to try to resolve their differences and failed to come to an agreement. Northern Ireland First Minister Peter Robinson and Deputy First Minister Martin McGuinness have criticized the disappointing level of proposed aid from Britain. In this environment, one question is: "Are there, realistically, alternative or supplemental sources of funding? What are they?" One idea that worked at the dawn of Éire in 1919-20 is Irish bonds. Éamon de Valera was born October 14, 1882 in New York City and was elected president of the first Dáil from June 1918. He left Ireland from June 1919 to December 1920, leaving behind the leadership of the Irish Republic to Michael Collins. His mission was to sell to Irish-Americans bond certificates in denominations of $10 (nearly $120 in today's dollars) and $25 (nearly $300 in today's dollars). He was successful, raising $5.5 million ($65 million in 2014 dollars) from American supporters, far more than the Dáil expected. Of this, $500,000 was reportedly invested in supporting the election of Warren Harding, the winning (Republican) presidential candidate in 1920. Irish Catholics in the United States were still outraged at Democrat Woodrow Wilson's having brought the United States into the Great War on the side of Britain. Seeking a way to use U.S. economic incentives to bring together Northern Ireland and Éire in peaceful cooperation, Comptroller Hevesi of New York City proposed an Ireland Peace Bond that would gather financing from several governments (U.S., Irish Republic, Northern Ireland and others). The Peace Bond proposal was put together by a team in the Comptroller's Office. The models for this were both de Valera's 1920 Irish bonds and the successful sale of Israel Bonds to Americans since World War II. The idea behind the Comptroller's Ireland Peace Bond was that it would support an Irish Development Bank to make loans to businesses in Northern Ireland and the border counties in Éire. For pension funds to invest in them they would require a U.S. Government guarantee of principal. The proposal was endorsed by President Bill Clinton but when hostilities resumed in Northern Ireland the idea was scrapped. When hostilities were again ended, the idea for an Ireland Peace Bond was revived by then-Senator Hillary Clinton. As mentioned, British Prime Minister Cameron and Taoiseach Kenny left Belfast earlier this month having failed to agree on contentious issues, especially the need for more British support for the Six Counties in the north. Sinn Féin's president Gerry Adams criticized Cameron's financial package, which proposed to replace aid with £1 billion over 5-6 years in the form of 25-year loans with interest, as did SDLP leader Alasdair McDonnell. Northern Ireland's First Minister Robinson and his Deputy McGuinness, speaking at Stormont, were also critical of Cameron's offer. Irish officials have been looking at options, with their eyes on the success of the Scottish independence movement in promoting devolution. One idea is to imitate de Valera's success a century ago and appeal for funds to Irish Americans. I was appointed Chief Economist at the New York City Comptroller's Office under Comptroller Liz Holtzman. When Alan Hevesi was elected I was made part of the team that went to work in 1995 on the Comptroller's plan for an Ireland Peace Bond. Back in 1995, the concept was for a development bank that would invest in business. In 2014, the concept looks more like a traditional government bond for infrastructure, a "revenue bond" that would build something that would generate rent to pay off the bond. The Northern Ireland budget experts will have to see how this might help their 2015 budget over time. If the bond is not designed and invested well, it will create debt-service obligations that will be hard to keep up with. What would the advantage of an Irish Peace Bond be over Cameron's 25-year loan proposal? It would depend on the details. The Ireland Peace bond might carry a lower interest rate if Irish Americans viewed buying the bond as an obligation of their heritage. In contemporary terms it could be thought of as crowd-funding for a peaceful and devolving Northern Ireland. Since this was written, the outlines of a package were agreed upon. Britain offered more money, a mix of loans and cash. If the deal stays together, the sale of Irish bonds to Americans would be in addition to, not instead of, financing and aid from London. 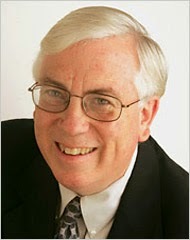 Floyd Norris, the chief financial correspondent and business columnist for The New York Times, accepted a buyout and is exiting The Times today. A brief note says simply: "This is Floyd Norris's final column for The New York Times." His departure is part of a reduction in editorial-side staffing of 100 positions, the fourth round of reductions since 2008. His swan song, after 26 years with the newspaper and 15 years in his current position, is about the financial foxes (not his words), the people who take risks with our money and want taxpayers to bail them out when they destroy the financial system. His opening question is: "What happens when you turn over regulatory responsibilities to people who think there is really no need for regulation?" The question answers itself - regulation becomes lax. In case you were wondering what specific case Norris had in mind, his column, "High & Low Finance", goes on immediately to talk about Alan Greenspan, a disciple of Ayn Rand who described himself as a "market fundamentalist" who believed "markets were far smarter than governments" and should be left alone to do their work. The term "market fundamentalist" has since the financial meltdown of 2008 become, he says, a term of derision. Greenspan was made Chairman of the Board of Governors of the Federal Reserve System. I used to work for the Board of Governors as a financial economist when the Chairman was William McChesney ("Bill") Martin, Jr. His most famous quote, repeated by Norris, is that the Fed's job is like that of a chaperone who orders the punch bowl removed just as the party is really warming up. Greenspan let the punch bowl stay in place until the place was trashed. The most important financial innovation that I have seen the past 20 years is the automated teller machine. It is sad for me to see Norris take so much knowledge with him out of The New York Times, especially since I like the thrust of his swan song. Janet Yellen is more like Martin than Greenspan, seeing the Fed as having a big job to do not just in controlling interest rates to influence the pace of economic growth, but also - and, in her view, independently - regulate the financial system on a targeted basis to control the risks from too-big-to-fail institutions and from institutions that have been engaging in risks that are far beyond their capital adequacy to absorb. But the regulatory system we were left with after the go-go Greenspan years is not something we can be comfortable with. During the era of weak financial regulation, the shadow banks - risk-taking sparsely regulated investment banks - were at work leveraging their capital. This has happened before. After the crash of 1929, the Federal Reserve was paralyzed (the only person who understood what should be done, Benjamin Strong, died the previous year). Eugene Meyer, the head of the Federal Reserve System, wrote a long memo to President Hoover explaining in well-written prose why the Fed didn't have the power to do anything at all. Hoover tried to impress on FDR that the three biggest financial problems facing the country in 1933 were inflation, budget deficits (at all levels of government) and excessive government spending. FDR wasn't much interested in financial matters and he turned it all over to his team headed by Treasury Secretary Will Woodin, a Republican business executive who came out of the railway rolling-stock manufacturing business. It is remarkable what a great job they did, restoring confidence in banks in a few weeks, performing stress tests on each bank via Treasury auditors before it was reopened (some were not), producing $2 billion in new currency notes by working the Bureau of Engraving and Printing overtime and filming the trucks going out to different cities so that the public could see in their movie theaters that cash was on the way. Most important, in 1933 FDR's team - with Senator Carter Glass and Rep. Henry Steagall - created a Federal Deposit Insurance Corporation to insure bank deposits and, in return for this gift to the commercial banks, a system for protecting taxpayers from the risk that shadow-banking foxes might speculate with insured deposits. Amazingly, the system worked pretty well for 70 years despite the constant chipping away at the protected henhouse of insured commercial banks by the financial foxes who wanted access to insured (and therefore risk-blind and cheap) deposits. When the market fundamentalists get to meet their makers and they ask God why She didn't warn them about the possibility of a global financial meltdown of the scale of 2008, I can imagine the reply: "What do you mean? I gave you the Savings and Loan Disaster, Long-Term Capital Management, Enron, Global Crossing, WorldCom... None so blind as will not see." of many women since 2000 is a puzzle. The New York Times series by its Upshot staff on "nonemployment" is another reminder of what a great newspaper can do to put in front of the public the data and research that a democratic society needs to make decisions about public policy. I have posted at least four times on the subject in the last year and a half. The term "nonemployed" appears to have been formally introduced in 1997 by two University of Chicago economists as a broader category of nonworking people than the unemployed. They aren't working but are self-described in surveys by the Census Bureau for the Bureau of Labor Statistics as currently available for work and actively looking within the four weeks prior to the survey. Two articles in the Times series on nonemployment have appeared. The first, by David Leonhardt, introduces the topic and stresses "the Decline of Work" as the theme. The central number he puts in front of us is that back in the 1960s only 5 percent of men in their prime working years of 25 to 54 did not work. Today, the number has more than tripled, to 16 percent. Is this a terribly worrisome number? Up till 2000, the relaxed response might have been: "Sure, relatively fewer men are working, but a far higher percentage of women are working, so that's the reason." It is natural that some men of prime work age might stay home to look after their elderly parents or children. But, since 2000, the share of women who are working has also been declining. So it is fair to say that since 2000 "the Decline of Work" applies to the population as a whole. A team composed of the Times, the Kaiser Family Foundation and CBS has set about trying to find explanations of the decline through polling. Of men aged 25-54, 64 percent would like to have a job. But only 45 percent have been actively looking in the last year (a looser definition than that of the BLS, which wants to know if they have been looking in the prior four weeks). In other words, about 30 percent of those nonemployed who say they would like to have a job have not looked for work within the prior year. Why not? Well one reason is that one-third of the nonemployed have been convicted of a crime. Nearly half of the nonemployed say they suffer from a disability or from general health problems and 43 percent say that not being employed in itself is bad for their mental health. An amazingly useful chart shows the nonemployed status in every county in the United States, shaded to show where the nonworking status is most prevalent. The numbers are more complete than the unemployment numbers of the BLS, which by definition covers only the "civilian noninstitutional" population. The BLS therefore excludes the military plus institutionalized populations such as those who are incarcerated, presumably because of the difficulties inherent in conducting random-sample surveys of such populations. This chart should be pondered by every elected official in the United States. The research brims with public-policy implications. It supports bipartisan efforts to reduce the sky-high U.S. incarceration rates and to lower the high barriers to re-entry in the job market resulting from licensing requirements that are not related to job performance. I believe it supports programs for more apprenticeships among younger workers and Kurzarbeit-type programs to keep older workers work-ready during a recession. Surely not by coincidence, the Times editorializes in favor of Mayor de Blasio's plan to try to keep the mentally ill who do not pose a risk to others out of jail because 40 percent of the 11,000 people in jail in New York City are mentally ill - an increase from a few years ago when the figure was 25 percent. Many of the inmates were arrested and convicted of low-level crimes such as not paying a fare or trespassing. These mentally ill inmates are expensive to incarcerate because they stay twice as long as other inmates since they find it harder to obtain bail. The Times is making an important contribution to public policy formulation for our recovery from the Great Recession. As the economy picks up we will need workers and the sooner we identify the reasons why people are not working and address them, the better prepared we will be to put them to work. 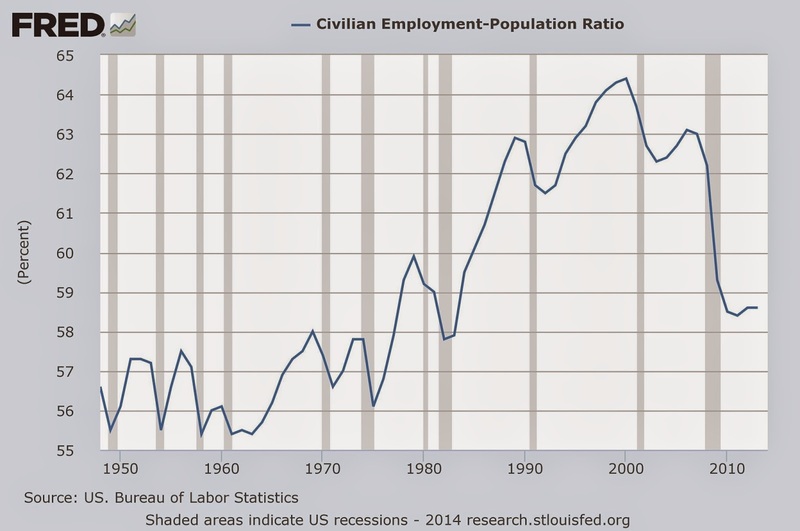 However, I wish that the Times would help the public understand how the concept of nonemployment fits together with something that has been measured and reported regularly since the Full Employment Act was passed after World War II, namely the civilian employment-population ratio. This indicator, which is presented at the top of this post, pretty fairly presents the extent of the nonemployment problem over time, although it omits the institutional populations that bulk large in some parts of the country. been lower-paid jobs in hospitality, retail and administrative/waste services. The headline news about the November jobs report is that 321,000 new payroll jobs were created, seasonally adjusted, and the unemployment rate was steady. Also, hourly wages rose 0.4 percent, double the expected rate. A troublesome aspect of the recovery (see chart at left) is that wages have stagnated because jobs have been growing in lower-paid industry sectors–retail, hospitality (especially food services and drinking places), administrative and waste services. 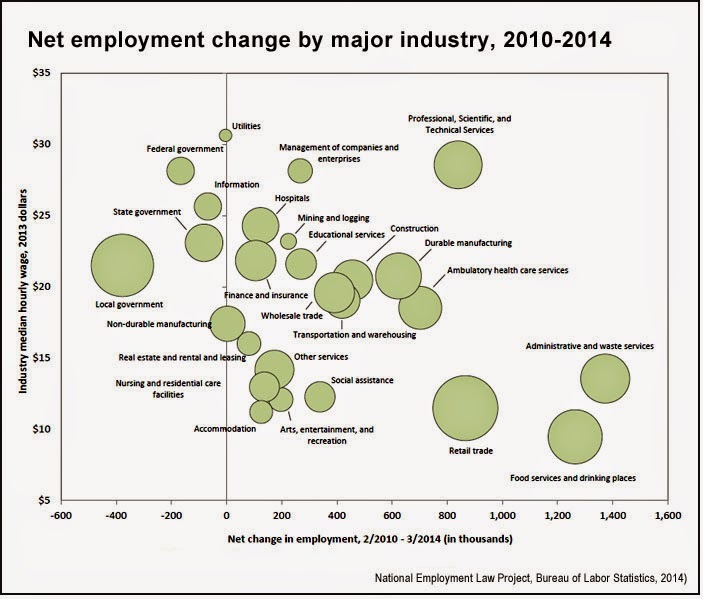 So an interesting place to look in the monthly BLS job numbers is the industry-sector breakdown. This information is in Summary Table B, which is provided below in slightly simplified format with comments attached to each sector. Interesting sectors in November were nondurable goods manufacturing, retail trade, information services (includes a lot of tech companies), financial activities (heavily concentrated in NYC), professional and business services, health care, leisure and hospitality and other services. Sen. Randal ("Rand") Paul will be pleased that growth in government jobs is slow, but the loss in government jobs has been a drag on the economy, especially since government workers are paid above-average wages. Great, but is some growth at expense of December?